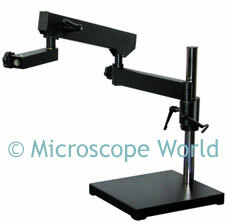 A microscope focusing holder is used to connect a stereo microscope body to the microscope stand. If you have a stereo microscope body and would like to mount it to a boom stand, you will need to know two different measurements. #1. You need to measure the diameter of the body, to ensure it will fit in the focusing holder you are purchasing. Above is a Meiji Microscope focusing holder, with inside diameter of 84.2mm, to accept an 84mm diameter stereo microscope body. This focusing holder is made to fit a 20mm arbor, or mounting post. The #2 item you will want to measure is the arbor on your stand. The red arrow above is pointing to the arbor. 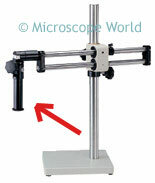 If your arbor does not fit the focusing holder, you won't be able to connect your microscope to the stand. A different type of microscope focusing holder uses a 5/8" pin mount (shown above) to connect to the microscope boom stand. This is a fairly universal size mount and increases the number of stands that a microscope body can be mounted to. The articulating arm stand above can be purchased with several different sizes of arbors (mounting posts) or with no arbor, it could be used with the pin-mount focusing holder.